A Parents Handbook is provided, outlining the Policies and Procedures of our kindergarten. All children have a ‘Celebration of My Achievements’ File, which is given out on a monthly basis. It tracks their development and interests through observations and provides families with detailed insight into their child’s progress. 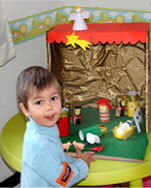 Families are encouraged to contribute through observations of their child at home. Parents’ Evenings are arranged twice a year, where individual appointments are offered. This is an opportunity to share some ‘quality time’ with your child’s teacher where questions can be answered and ideas shared. Open mornings are arranged throughout the year where we welcome our visitors’ comments and recommendations, and where parents can take part in the achievements of their children. Being an international setting we appreciate parent involvement and ideas for our “Holidays around the World” project. Parents are welcome to come and present along with their child their country, customs, traditions, folk stories, etc.